Over the course of the last 30 years, the Spokane area in Eastern Washington has grown tremendously. What started as mostly farmland has now evolved into an entire valley with multiple small towns and populated areas. The area from just west of Spokane to the Idaho border is now called the Spokane Valley. Today, there is a quiet populated place that sits on the border of Washington and Idaho called Greenacres. This small town was incorporated in 2003 and as of the last census taken in 2010; the population is now roughly 5,000 residents. Living in a populated place like Greenacres has become a popular lifestyle because of the quiet space to live combined with the location of being in the center of Spokane and Coeur d’Alene. If the combination of small town life and big city entertainment is something that you are longing for, you must contact Nancy Wynia today so she can help you get the lifestyle you have dreamed of. One thing that concerns many parents about living in a populated area as opposed to a big city is the quality of education that is available to their children. The populated place of Greenacres is part of the Central Valley School District where students will attend Greenacres elementary school, Greenacres middle school and three different high schools. Each school offers opportunities for the individual needs of their students including smaller classrooms, schools that have been revitalized to keep up with growing trends so they can provide the highest quality education for students of all ages. The populated area of Greenacres is facilitated by the Spokane Valley Parks and Recreation Department meaning that you and your children will enjoy everything the entire Spokane Valley offers, not just the small community of Greenacres. There are multiple parks with over 180 acres of open space throughout the area so everyone can get a taste of nature. There is also a community center, three outdoor pools, a recreation center and senior center that are all maintained by the parks and rec department. There are recreation opportunities offered for all ages from 3-93 so there really is something for everyone. At the heart of the parks and rec department is the Center place center. This is a large community center where many different community events take place including potlucks, parties and weddings. 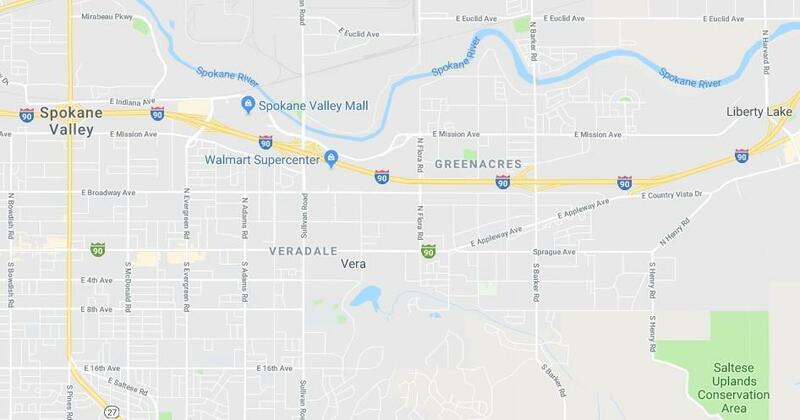 When you live in Greenacres, it is likely that you will work in either Spokane or Coeur d’Alene. This works to your advantage because you will be able to enjoy the quiet lifestyle without sacrificing your financial well being. There are many opportunities in both locations including big business, financial business and more casual opportunities including hospitality management and various seasonal employments through the local resorts. The beauty of living here is that no matter what your trade may be, you will be able to find an employer who suits your needs. One of the best parts of living in Greenacres is the entertainment that is available to you. Greenacres is just a short drive to the west to Spokane and to the east is Coeur d’Alene. Additionally, you and your kids will enjoy area attractions like Silverwood Theme Park located just north of Coeur d’Alene. Spokane is home to a host of events including the yearly Bloomsday Marathon that brings in thousands of competitors from all over the Northwest. You will also enjoy all types of concerts and theatrical events held throughout the year in the Spokane arena and year round shopping in any of the malls in the area. Greenacres is also about a 6-hour drive to the Seattle area where you can always find fun things to do. Seahawks football has been a favorite since their repeat appearances to the Super Bowl as well as Mariners Baseball. You can enjoy strolling the waterfront or shopping in the infamous Pike Place Market. Seattle is far enough away that you can make a weekend vacation but it is also close enough that you can drive over in the morning, spend the day and be home late the same night. Coeur d’Alene is the hub of Idaho. Located right on the I-90 corridor this is a hot spot for tourists and locals who enjoy the abundance of shopping and attractions. In the summer, residents and visitors alike enjoy Lake Coeur d’Alene and the winter offers a winter wonderland complete with skiing, snowboarding and snowmobiling. There are attractions and events during every time of the year in this hustling tourist town. If the quiet life of small town living is something that you have dreamed of but the thought of sacrificing your career has been the stopping point, then this populated area is the place for you. You and your family will love the area, the people and the opportunities in and around the area. From the central location that offers entertainment and employment opportunities to the high quality education and the abundance of parks and sporting opportunities, Greenacres is possibly the perfect place to live.